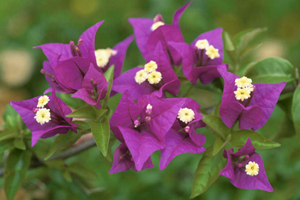 Bougainvillea, a native of Brazil is a deciduous (leaf losing), climbing woody vine. Tiny white flowers usually appear in clusters surrounded by colorful papery bracts, hence the name paper flower. Single and double flower forms are available. The woody trunk tends to be twisted and the thin stem have sharp thorns and dark green leaves. Bougainvilleas can be easily grown as a hedge, an arch or a tree on the ground and in pots. Bougainvilleas available in a variety of species, is ideal for bonsai. Bougainvillea may be grown from root cuttings and branch cuttings. Cuttings can propagate plants easily. Cuttings should be planted in a shady area until they form roots. The shoots, a few inches in length, can be replanted in sandy soil with bottom heat and moisture. Half-ripened or old woodcuttings in six to twelve inch lengths may be rooted April to June. Bougainvillea does best in dry conditions. They need full sunlight light, warm weather and well drained soil to flower well.